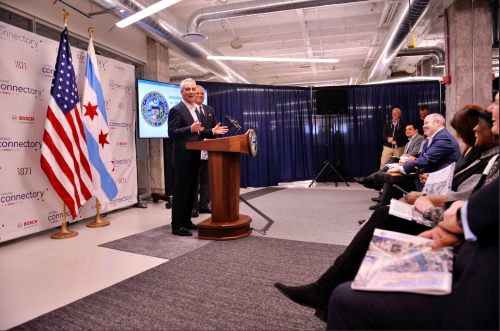 Support investments in infrastructure to meet the Chicago’s “mobility goals,” which include transportation electrification, micro-mobility services, and accommodating freight delivery growth. Prepare for the arrival of connected and automated vehicles or CAVs. The report’s 50 specific policy recommendations cover a wide range of actions, from raising the state’s fuel tax to establishing a Chief Mobility Officer position, give businesses incentives to provide public transit benefits to employees, launch a pilot to study the impacts of CAVs, conduct a scooter-sharing pilot in 2019, and evaluate ways to restructure transportation-related taxes and fees to better support mobility goals – which includes reducing the reliance on single-occupancy vehicles.